The cheapest and most profitable oil North America has ever seen is now "flooding" into the market, as producers once again use old technology to create a wave of new profits. Producers are using "waterfloods"-pushing water into underground formations to flush a large amount of oil out to nearby producing wells-to increase production and profits. It's the next big money-making phase of the Shale Revolution. 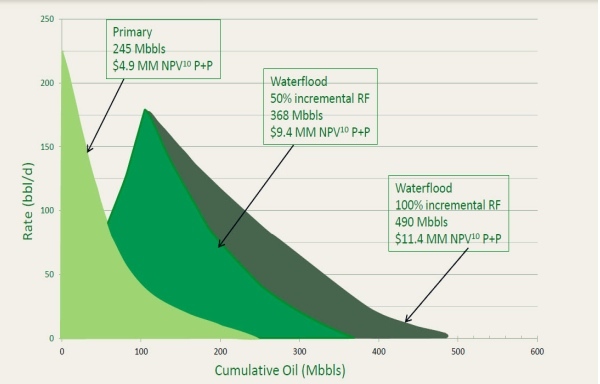 Waterflooding has been around for 70 years or more, but the Big Question over the last five years has been-can you do it effectively with tight oil? The answer is a Big Yes, and waterflood potential has become so important that institutional investors now see them as major share price catalysts for junior producers-and track them closely. Waterfloods start 1-2 years after drilling the well, in a time window producers call "secondary recovery." (Drilling is primary recovery.) Waterfloods are cheap to try and cheap to run (with most operations costing just $5-10 per barrel! ), and now the industry is seeing that they are sometimes doubling reserves from a well. "Secondary recovery is where you really make all your money in this industry," says Dan Toews, VP Finance and CFO of Pinecrest Energy (PRY-TSX.V). Pinecrest is very vocal about their waterflood potential. They say they can double the amount of oil they recover (called the Recovery Factor, or RF) from a well-at less than $15/barrel-half the price of primary recovery costs, which are over $30/barrel. "Everyone is trying to find a new resource play," says Toews. "First you find a resource, and then you drill it like crazy. But the second stage is to go in for your secondary recovery, through waterflooding of some kind if possible." To date, Pinecrest isn't yet flowing even one barrel of waterflooded oil-so their powerpoint slide is just projections. Toews and his team expect to be waterflooding all of their operations by the end of this quarter. But analysts are already seeing the waterfloods as a share price catalyst. "Just about every investor and institution we talk to wants to know the status with our waterfloods," says Toews. "The buyside (fund managers= buyside, brokerage firms=sell side-ed.) is very savvy on waterfloods. Once we apply the method, this is what has the potential to shoot up our share prices." Realistically, the effects can be seen within 2-3 months, but it's best to give them a year-or more-of operations before judging their impact. Waterfloods can last up to 20 years or more. Another Canadian oil junior, Raging River Exploration (RRX-TSX), also explains the waterflood potential in their powerpoint. They expect to be swimming in 1 million EXTRA recoverable barrels of oil per square mile, courtesy of waterfloods-at an even cheaper cost of $5-10 barrel, vs $30 barrel for the first 600,000 barrels. Raging River is developing the Viking formation in SW Saskatchewan-a large, tight oil play that since the 1950s has had an improved outlook from 2 billion barrels of oil to an estimated 6 billion barrels of oil in place, all thanks to horizontal drilling. Raging River expects waterflooding to increase its RF from 8% from primary recovery methods (drilling vertical and horizontal wells) using 16 wells/section, to 16-20%. The simple math says that will increase the number of barrels recovered from 480 million at 8% to 1.25 billion at 20% RF. If Raging River-or any producer-can show a steady RF for over a year, I would suggest to investors those barrels will be worth $10-$15 each-creating huge value to shareholders on a buyout. Some Viking waterfloods have even seen results as high as 30% RF. "A small change of recovery over a large oil field is significant and adds a tremendous amount of value," says Scott Saxberg, President and CEO of Crescent Point Energy (CPG - TSX), arguably seen as the industry leader in the waterflooding revival. "A lot of these unconventional plays (tight oil) are in high decline. By implementing waterfloods, we can lower the declines in the field, and increase reserves. There's huge value to that." Crescent Point started waterflooding its properties five years ago when multi-stage fracking (MSF) was new on the scene. Now they have five years of knowledge that the method works, and that they can use it across all of their fields. "We recognized right away to implement a strategy to increase the recovery factor on a multi billion barrel pool," says Saxberg. "If you change even 1%, that ends up being huge." "Waterflooding is the next step past in-fill drilling (ie. drilling more holes in less space to increase ultimate recovery). It takes a lot of time to accrue knowledge and data on how to properly implement it. The sooner you start, the better data you have." According to Saxberg, waterflooding is more than just a cheap way to float balance sheets. Over the course of Crescent Point's five-year waterflooding program, they've developed hundreds of different combinations of waterflooding techniques coupled with fracking techniques, well spacing and plenty of other factors. "Water flooding is basic, in that you pump water into the ground," says Saxberg. "So to enhance that, you have to look at what type of patterns are in your reservoir. Now these are unconventional tight reservoirs, so the question was, can they actually be water flooded?" Again, the Big Answer is Yes, and management teams are now using the promise of waterfloods as a cheap way to float their balance sheets earlier in a resource play. But Saxberg says waterfloods are truly more long-term value. "They are a long term day-after-day technical grind and process. So it's not the same as drilling a well and seeing 100bbls/day. It's a lot of ups and downs and a lot of long term view." There's only one negative here that I see-how will all that cheap oil affect North American pricing, when the continent is already swimming in the stuff? In the short term, the pro-forma economics of waterfloods are making a splash with both management teams and the market. But medium term and beyond, it will create a quandary for juniors-the easy money comes after huge capital spending.